Pasta is a great material for creativity. First, modern industry produces a wide variety of pasta shapes that allows experimenting with creating compositions. Secondly, this material is always at hand. In addition, the process of creating handicrafts of pasta is simple. – Paints for giving different colors of pasta ( acrylic or aerosol). Macaroni need to be painted and dried before starting work. – PVA glue, as well as any varnish. – In some cases any base (which, you may want to decorate with the help of pasta), sometimes you may need a fishing line, natural materials, ribbons, etc. A set of materials is determined by what you want to do. Pasta of different shapes can be used as a base and figures on the mural. In addition, for these artefacts you can use natural materials: twigs, dried berries, seeds, leaves, etc. You can make something like a mosaic instead of panels: draw a picture and then put macaroni of suitable forms. So you can make a figure of a lamb, hedgehog, etc. 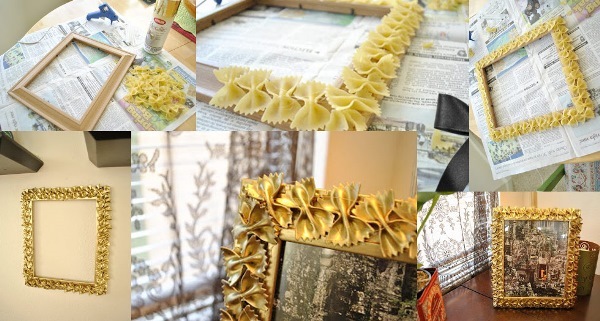 You can perform more complex work, for example, to decorate a bottle, vase or picture frame withmacaroni. Pasting macaroni on volume figures (dishes or picture frame, frame for painting, etc.) is a quite tedious process. However, you can create unusual items with a creative approach, for example, complemeting the composition of pasta with coffee beans, seeds (eg, beans), natural materials. 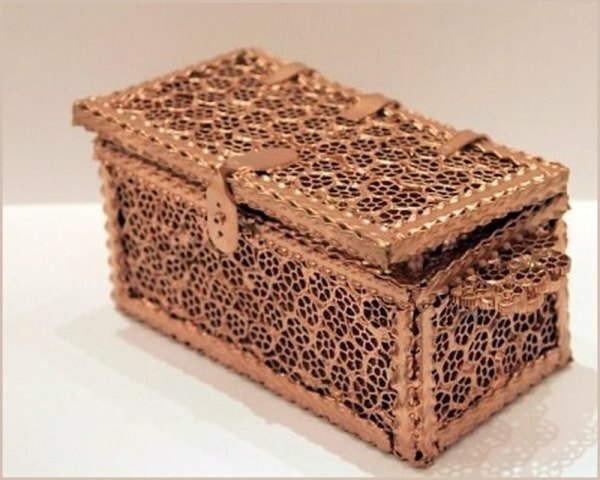 Staining similar decor elements in golden or bronze color, will give your creations metallic appearance, so that it will be impossible to understand what they are made of. Crafts of pasta can be not only decorative. Similarly decorated items are fully capable to carry some function. For example, you can put flowers in vases, insert photos in photo frames, and put different things into boxes decorated with pasta.